Want to get away from the touristy areas? The following is a range of wonderful rural accommodation in sunny Mallorca (Majorca) - all within driving distance of the beach or major centres, should you still wish to visit! Binibona - in the undiscovered heartland of northern Majorca is the perfect location to enjoy a wonderful break. Here you can breathe the clean mountain air, scented with rosemary and jasmine plants, and enjoy the peace and tranquility of olive groves, where the only sound is the distant chiming of sheep bells. A short drive from some of the island's most spectacular beaches and from fascinating mountain villages untouched by modern development. Should you wish to explore further, the colourful and historic city of Palma, is a mere 40 minutes by car. (Can Furios Petit Hotel). Imagine the perfect holiday - stress free days spent relaxing in the Mediterranean sunshine, enjoying breathtaking mountain scenery while residing, in five star comfort, in an enchanting sixteenth century villa. Imagine yourself a guest at Can Furiós, one of the finest country house hotels on the Balearic Islands; Majorca's best kept secret awaits you amidst the spectacular Sierra de Tramuntana, in the un-spoilt hamlet of Binibona. Situated in the north-west of the island, Can Furiós is an enchanting country retreat offering superb cuisine and accommodation of the highest standard. The original house, with its twin Moorish towers, has been sympathetically restored by local craftsmen to provide every modern luxury while retaining its traditional character. The hotel has a spacious private bar open exclusively to hotel residents. Campos, agricultural village surrounded by privileged rural landscape, within 5 minutes distance of the bird reserve of "Es Salobrar" and the nature reserve of "Es Trenc" with 8 km of beautiful virgin beach. Come join us and succumb to the traditions of Mallorca life style, allowing you to experience why Mallorca is known as "the island of tranquillity" (Isla de la Calma). The farm is run by the original owners who also personally take care of your stay, making it as enjoyable as possible. At Son Lladó, our main objective is the maximum satisfaction of our guests. In order to make your dream holidays come true, all our services and experience are at your disposition. At Son Lladó, you will find the tranquillity you desire, breath the fresh air of the country side and relax in the rural surrounding of a friendly and comfortable farm house. We can offer you our 28 acres of farm land and a series of varied and enjoyable activities. Deià - Between the Mediterranean and the spectacular Tramuntana mountains stands the tiny village of Deià. Beautiful area for walking and hiking. Between the Mediterranean and the spectacular Tramuntana mountains stands La Residencia, in the tiny village of Deià which offers a natural enclave for a luxury hotel of international fame. 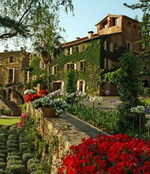 The hotel consists of two manor houses dating from the XVI and XVII centuries, carefully and lovingly restored. Furnished with Spanish antiques, local fabrics and a wealth of local art, the hotel imbues both elegance and informality that carefully combine to provide relaxation in style. Privacy is paramount at La Residencia’s newly refurbished luxury suites. Three suites with outdoor pools, one with plunge pool, each with a private terrace and an area for sun lounging or for dining, with breathtaking views. 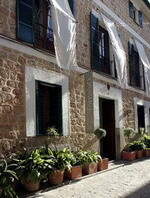 Fornalutx - At the foot of the spectacular Sierra de Tramuntana and only 3 kms from Soller city and 6 kms from the beach. Beautiful area for walking and hiking. 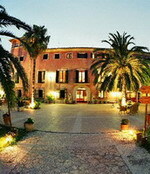 Small charming hotel, located at the foot of the mountains Sierra de Tramuntana and at only 3 km. from Soller City, 24 Km. from Palma and 6 km. from Puerto de Soller (beach). The hotel, which was some years ago was a nuns convent and the school of the village, is located in an narrow street without traffic, with a pavement decorated with plants and flowers, giving a fantastic environment and beauty to the place. The house offers 6 double rooms with bath and 2 suite rooms which are very well furnished. The breakfast room is located in a natural cave, very well decorated, offering a copious buffet. The terrace has a wonderful view over the valley of orange trees and the mountains, where you can hear the singing of the birds, is also used in the spring in autumn and the summer time to take breakfast and to enjoy the blue sky, the peace and the landscape of the region. Inca - the capital of the Raiguer district, is a long, narrow strip of land located between the Tramuntana Mountains and the Es Pla district. Thanks to its geographic location in the centre of Mallorca and excellent road and train connections, Inca is a strong commercial centre. Interesting visits include the Church of Santa Maria la Major, and the monasteries of Sant Domingo and Sant Francesc with its cloisters and examples of civil Gothic architecture. Come with us to the center of the island and discover the hidden secrets of the small island villages. Savor the history that resounds from their cobble-stoned streets, their stonework façades, from the very people themselves. Follow marvelous itineraries beneath the tranquility and majesty of the hills as they paint a curved line across the island. Casa del Virrey, hidden on the plain, offers the perfect refuge and base from which to explore the still undiscovered Mallorca. This house has sixteen rooms between suites and double rooms, with the feudal noble charm and the traditions if times long past. The period decor boast absolute tranquillity, between works of art, oil paintings, tapestries and genuine museum pieces.